8:21 – â€œIt sounds like Sam Eagle is doing all the announcing.â€ – Freddy Age 8 as the former presidents come out. 8:48 – Rick Warren. A solid and appropriate public prayer from an evangelical Christian. After invoking God as Father and praising him as creator, Warren echoes the phrasing of the Shema (Deuteronomy) and the opening surah of the Quran. â€œWe celebrate a hinge-point of historyâ€ is, unfortunately, an applause line, and the crowd responds as invited. This takes the prayer momentarily into a strange place. â€œLand of unequaled opportunityâ€¦ Dr. King and the great cloud of witnesses SHOUTING in heaven.â€ This too is an applause line, but the crowd seems to have figured out that applauding is not appropriate here, because an invocation is not a convention speech, and they defer their chance to clap. Courage, integrity compassion. Help us O God to remember that we are Americans. The â€œForgive usâ€ litany is good. â€œNew birth of clarity in our aims, responsibility in our actions, humility in our approaches, and civility in our attitudes even when we differ.â€ May all people of good will today join togetherâ€¦ accountable before you. We now commit our new presidentâ€¦. into your loving care. There was some discussion about whether Warren would pray in the name of Jesus, and he recently assured people that he would do so. And does he ever: â€œI humbly ask this in the name of the one who changed my life,â€ he says, pointing to evangelical conversion, and then names Jesus in Hebrew, Arabic, Spanish, and English: â€œYeshua, Issa, Jesus, Jesus, the one who taught us to prayâ€¦â€ and then the Lordâ€™s Prayer. Well done. 8:53 â€“ Aretha Franklin. Wonderful. In a stirring example of life imitating art imitating life, she extended the â€œLet Freedom Ringâ€ conclusion to include the lines from the MLK â€œI have a dreamâ€ speech. A song like this had to include a chance for some vocal improvisation at the end, and this was a brilliant way to make room for it in a way that underlined the moment rather than distarcting from it. 8:57 â€“ Joe Bidenâ€™s oath of office. I am struggling now and will continue to struggle to take him seriously as a man in national office. 8:57 â€“ John Williams composition using â€œSimple Gifts.â€ Yo-Yo Ma, Anthony McGill, Gabriela Montero, Itzhak Perlman. Lovely. Wordless music is a nice break in the middle of an inauguration, which has to be a terminally wordy event. 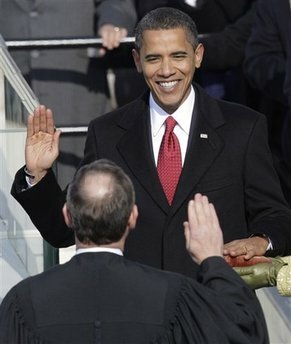 9:05 â€“ Chief Justice John Roberts swears Obama in. A few gaffes and stumbles, which are awkward, but actually kind of nice to see on such an over-choreographed day. 9:07 â€“ Cannons! Oh yeah. 9:08 â€“ President Obamaâ€™s address. I stand here humbled. Thanks president Bush. â€œRising tides of prosperity, still waters of peace. Gathering clouds, raging storms.â€ A bit of uncertainty for the listener; Which image describes our current situation? An echo of â€œWe the peopleâ€ â€“ nice. â€œOur nation is at war against a far-reaching networkâ€¦â€ good recognition. Economy down because of failure to make hard choices. Health care, schools, energyâ€¦ â€œindicators of crisis.â€ A bit of a campaign speech here. Letâ€™s hope this is Obamaâ€™s farewell to campaign mode. Goodbye, candidate Obama! Bring on the presidential tone of voice and terms from now on. â€œA nagging fear that Americaâ€™s decline is inevitableâ€¦â€ This is the kind of stuff Obama should be good at. If Barack Obama is disturbingly similar to Jimmy Carter in some ways, he ought nevertheless to be infinitely better at inspiring confidence and optimism. â€œKnow this, America: They will be met.â€ Applause. â€œChoose our better historyâ€ is a great line, deeply resonant with Obamaâ€™s personal symbolism. â€œRisk-takers, doers, makers of thingsâ€ carry us â€œup the long rugged path toward prosperity and freedomâ€ for us, for us, for us. A large percentage of this speech is devoted to rehearsing what previous generations of America have done for us, what we have inherited in being Americans, and how we should behave with that sacred trust. Thatâ€™s what this speech is about. â€œAmerica as bigger than the sum of our individual ambitionsâ€¦â€ is great for linking social and economic tensions right now. â€œEverywhere we look there is work to be doneâ€ is good, but inevitably leads to a laundry list: economy, health, scienceâ€¦ â€œharnessing the winds and the sunâ€ is dangerously grandiose, the kind of language Obama should avoid if he doesnâ€™t want to test our ability to believe in him. â€œThere are some who questionâ€¦â€ is also touchy territory, since it moves him back into the us vs. them rhetoric of campaigning. It also runs the risk of demonizing anybody who is skeptical about Obamamania, or who thinks that high spirits are just a placeholder for actual work that is still to be done. A few commendatory words about the market and its power, followed by warnings that it needs a watchful eye for the common good. These are well balanced sentences and sentiments for anybody who isnâ€™t already deeply concerned about Obamaâ€™s ideology. I, for one, am willing to be optimistic at the beginning of Obamaâ€™s presidency. Commendatory words about the Constitution. More good stuff about what our forefathers have done for us, the main theme. â€œWe are ready to lead once more.â€ â€“an applause line. Good example of the kind of thing that is true, but that George W. Bush would not have been allowed to say. Obama can say some of the same things and be believed. Okay, as long as theyâ€™re said. â€œWe are the keepers of this legacy.â€ — the central theme of this inaugural address. â€œWe know that our patchwork heritage is a strength, not a weakness.â€ This is great stuff, weakened somewhat by mixed metaphors. Bridges to the Muslim world and a warning to the leaders who oppress their people. â€œYou are on the wrong side of history, but we will extend our hand if you will unclench your fist.â€ Again, Obama can say this stuff. Frankly, I love to contemplate the good confusion that an Obama presidency will cause the Islamist regimes. They do their best to paint America as the great Satan that hates the Arabic world, but now their people will keep looking at the face of the American president, a dark-skinned man whose name is Barack Hussein Obama. And in his inaugural address, he puts Islamist regimes on notice that they are accountable to the political will of their own people, and to world opinion. To America: consume energy and resources less. The world has changed. Our soldiers even now patrolling the far-off desert. NBC cuts to soldiers in Iraq. Powerful visual cue. This sounds like a conclusion: What â€œfinally decides our fateâ€ is recited here in well-crafted allusions to heroic American actions from the past decade: broken levees, firemen charging upstairs, etc. Perfect conjuring of character. A man whose father 60 years ago couldnâ€™t have been served in certain restaurantsâ€¦ take this sacred oath. This is powerfully done. He speaks of himself without naming himself, speaks of himself in the third person, which creates a sense of distance and perspective. Let it be said by our childrenâ€™s children that when we were testedâ€ etc. A very good conclusion. Abraham Lincoln had the ability to make his listeners look at things from a long way off. Obama didnâ€™t do that at the opening of the speech, but here at the end he does it very successfully. He didnâ€™tâ€™ start 4 score and 7 years ago, but in these closing lines he helps us view our historical moment from an imagined future. 9:32 â€“ Joseph Lowery (Atlantaâ€™s Cascade United Methodist Church), benediction. Immediate power â€œGod of our weary years, God of our silent tears, thou who hast brought us thus far along the wayâ€¦â€ Excellent. Couldnâ€™t tell if he was reciting a poem, if the rhymes were consistent, or if it was poem-like language. â€œGlobal fiscal climateâ€¦ you got the whole world in your handsâ€ is a good balance of bland, newsy big words and regular strong speech. â€œFavoritism of the rich, the elite of theseâ€ echoes class envy rhetoric more than it ought to. â€œSpirit of unity and solidarityâ€¦ willingness to make sacrificesâ€¦ willingness to turn to each other, not against each other.â€ Amen. Echoes the â€œyes we canâ€ of campaigner Obama nicely. â€œAs we leave this mountaintopâ€ is good. â€œTanks beaten into tractorsâ€ (perfect!) gives way to MLKâ€™s favorite lines from Amos, â€œwhen justice shall roll down like waters.â€ Unfortunate bathos toward the end, descending from â€œbrown can stick aroundâ€ to â€œwhen yellow shall be mellow,â€ but Lowery was certainly right to end his strong prayer on a lighter note, to draw forth the responsive amens from the crowd.